In the 19th and 20th centuries Germans formed one of Cleveland's largest nationality groups. They began arriving here in substantial numbers during the 1830s, after the canals were built. The first German settlements were built along Lorain Street in Brooklyn and along Superior and Garden (Central Ave.) Streets on the east side. Succeeding generations have lived among the rest of the city's population. Between 1840 and 1846 Cleveland's population grew from 6,000 to 10,000. One third of this growth was due to immigrants arriving from Germany. By 1848-49, the German-born population reached 2,590 (60 less than the total of all other foreign-born residents). German immigrants remained the largest ethnic group arriving in the city until the mid-1890s. By 1900, more than 40,000 Germans resided in Cleveland. Immigration continued into the twentieth century, but on a smaller scale. German culture and customs in Cleveland have been preserved both in Gemuetlichkeit (public festivity) and German clubs. 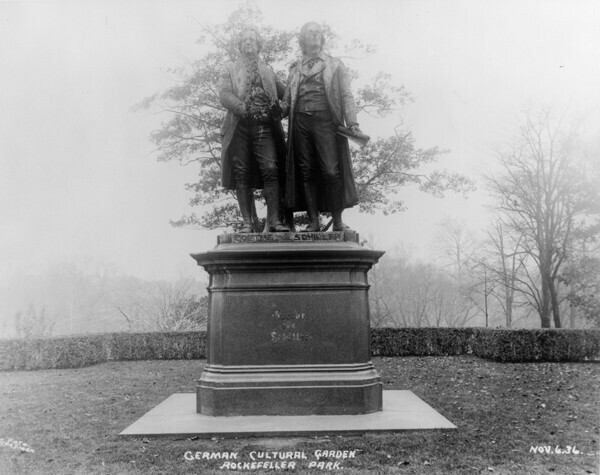 Clara Lederer writes that "The Cultural Gardens fountain, stone walks and double lateral sections of linden alleys center about an impressive bronze two-figure statue of Johann Wolfgang Goethe (1749-1832) and Friedrich von Schiller (1759-1805), Germany's greatest two poet-philosophers. 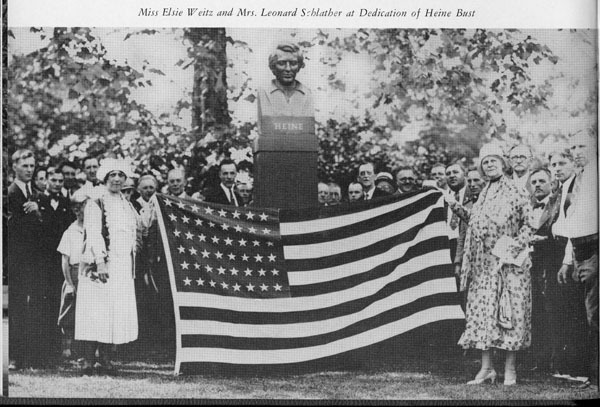 The statue is a replica of the famous Weimar statue, modeled in 1856 by Ernest Reitschal, the Dresden sculptor. Here tower the two mighty figures, joined in friendship as they were in life, and grandly dominate the spacious and imposing German Garden. 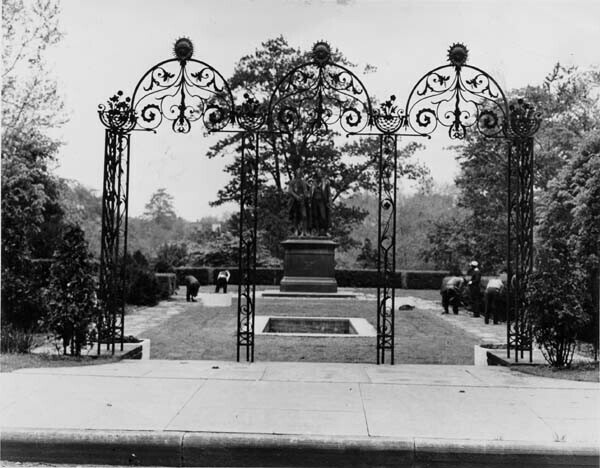 The garden is entered at the upper Boulevard level through a triple-arched ornamental iron gate. 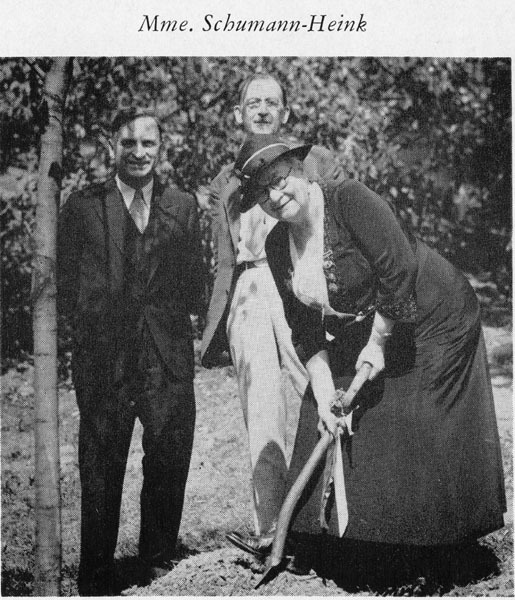 The German Cultural Garden was dedicated on June 2, 1929, as part of a week-long celebration commemorating the Lessing-Mendelssohn Bi-centennial. 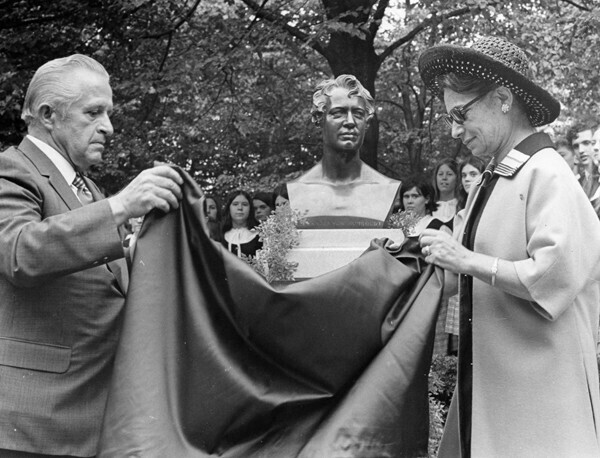 The Lessing bust was unveiled at this time, and the Goethe-Schiller statue, which formerly had stood in Wade Park, was rededicated in its new place of honor in the German Garden." The garden also commemorates other German heroes with plaques, busts, a gate and fountain. Among the many figures honored are naturalist and explorer Alexander von Humboldt (1769-1859), composers Johann Sebastian Bach (1685-1750) and Ludwig Van Beethoven (1770-1827), and artist and theorist Albrecht Durer (1471-1528). Phyllis M. Glaeser describes some of the challenges involved in the upkeep of the German Garden, but expresses optimism for the garden's continued revitalization. 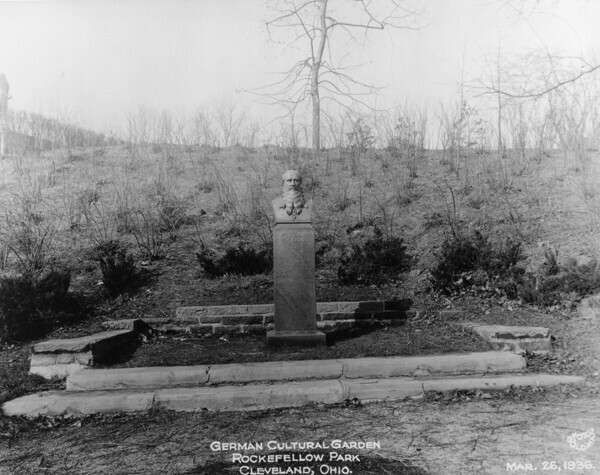 “German Cultural Garden,” Cleveland Historical, accessed April 23, 2019, https://clevelandhistorical.org/items/show/130.